This class includes all materials and skills needed to help you make two macrame plant hangings. We will start by having a demonstration and then making a "Ten" Knot Macrame, followed by a coffee break before we practice a few half sinnet knots to make your final piece. You may then embellish it as you wish so if you have any bangles, beads/buttons or coloured cords/string please bring them along for inclusion in your macrame hanging to make it unique to your style. Bring a small ceramic pot if you have one - about 10 cm x 10 cm. 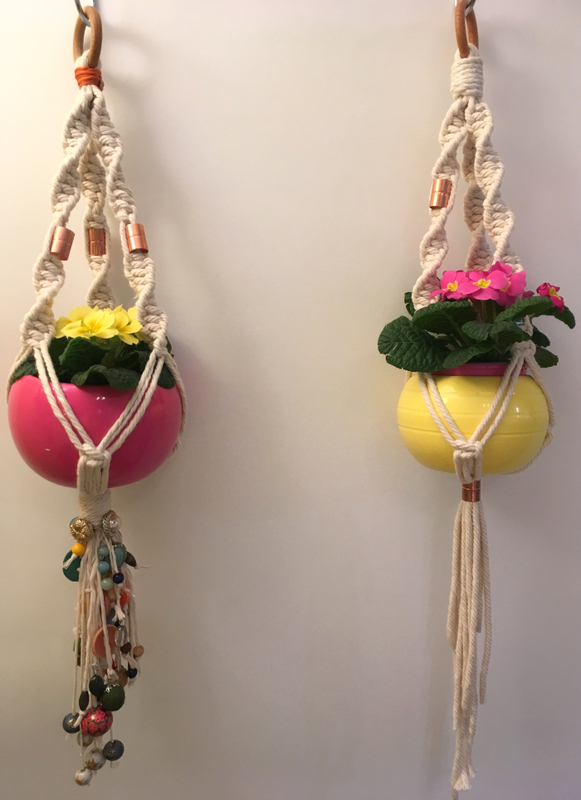 Once you have mastered the basics of a simple 10 knot macrame you will be able to make up last minute presents - maybe a potted primula for Mothers Day?! The possibilities are endless. I look forward to meeting you and sharing our ideas - after all two heads are better than one! !